In May, I posted a number of photos looking from the Lincoln Memorial east toward a spectacular sunrise. The gallery isn’t complete, though, without the views looking back at the monument. So, three months later, here are two of my favorites from that morning. 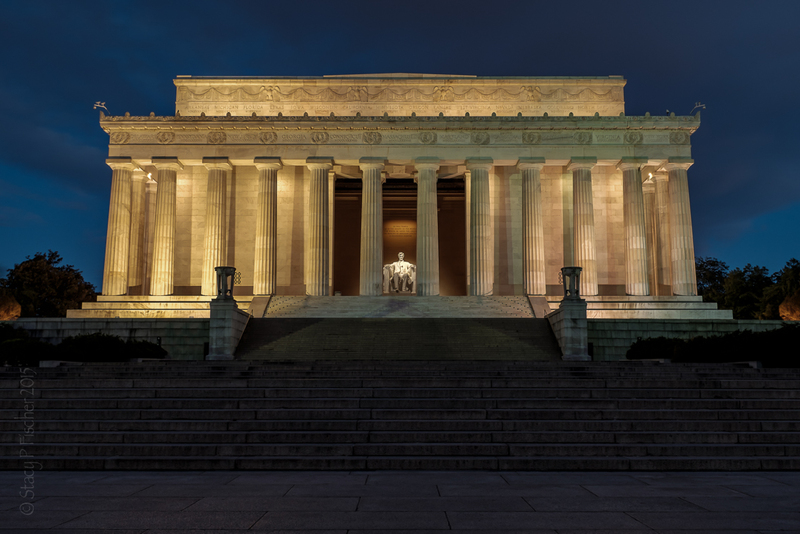 This entry was posted in Monuments & Memorials, Photo Challenges, Places, Washington, D.C. and tagged blue hour, dawn, Fuji X100T, Lincoln Memorial, photography, postaday, sunrise. Bookmark the permalink. Thanks, Patti. It was wonderful to experience the monument empty of tourists with only the joggers and a few other photographers around! 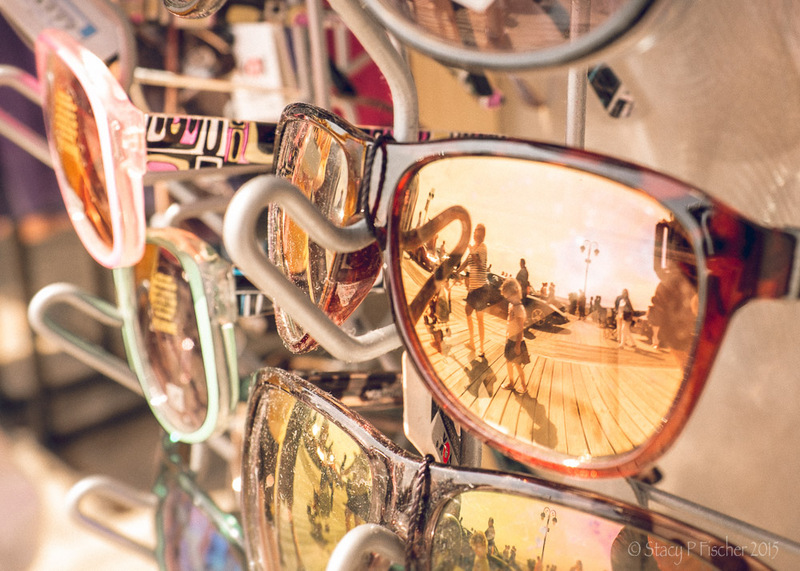 Gorgeous shots, Stacy. 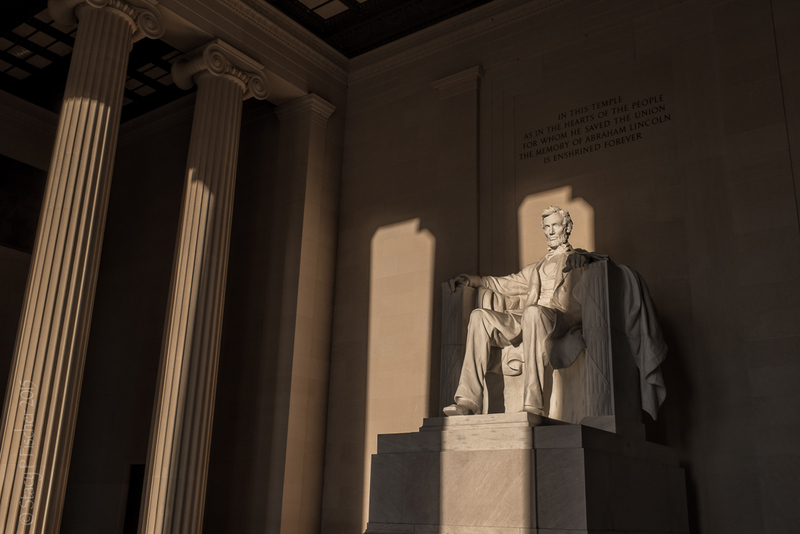 It’s wonderful to see Abe cast in beautiful light and without the throng of tourists normally there. You’ve captured the dignity of the piece beautifully. What a terrific experience. I love your enthusiasm for all your photo shoots, Stacy. You are clearly following your passion and it shows. It’s always a pleasure to stop by. My goodness. I hope we can pour a glass one day and you can share it in person. Meanwhile, hugs to you. Those are some incredible photos, I love the contrast and lighting in the first. I remember going to see the Lincoln memorial one snowy day in April and it was just spectacular! Especially when it’s empty of tourists 😀 Thanks, Kaz! I love the window of light on Uncle Abe. Well caught. He was just sitting there waiting for it 😉 But seriously, thanks! Oooh, I really like the 6:46. Like Abe’s watching the sun rise. Ha! I like that thought, Lisa 🙂 Thanks! I love those as well. In one the monument is so huge and makes Lincoln look so tiny and in the other Lincoln is the focus point. Beautiful! Ha, didn’t think about that, Laura! Thanks for the great observation and, as always, for your support!! Stunning photos. I love the light highlighting Lincoln. That’s my favorite of the two as well, Raewyn 🙂 Thanks! Stacey that first shot is amazing! When I visited Abe couldn’t be seen from outside the building due I guess to a combination of the light and shadows and the amount of people milling about. I was a little disappointed at that, so this is a double treat! Hi, Pauline! That’s one of the many benefits of visiting the memorial at the crack of dawn 🙂 So glad I could provide the view you missed on your visit! I love the way you’ve caught Lincoln in the frame of light. That’s a wonderful shot.